The Peterborough and District Labour Council annually presents a cheque and a copy of the book Standing Strong, Facing Forward (The history of the labour movement in Peterborough and District) to one student from each of the five secondary schools in Peterborough. The individual schools select the recipient. Purpose: To identify a high school graduate who demonstrates an appreciation of the role of labour and provide them with monetary assistance to attend either Fleming College or Trent University. Selection will be made from a pool of applicants to receive a scholarship in the amount of $500.00 to support them as they enter their first year of full-time post-secondary studies. 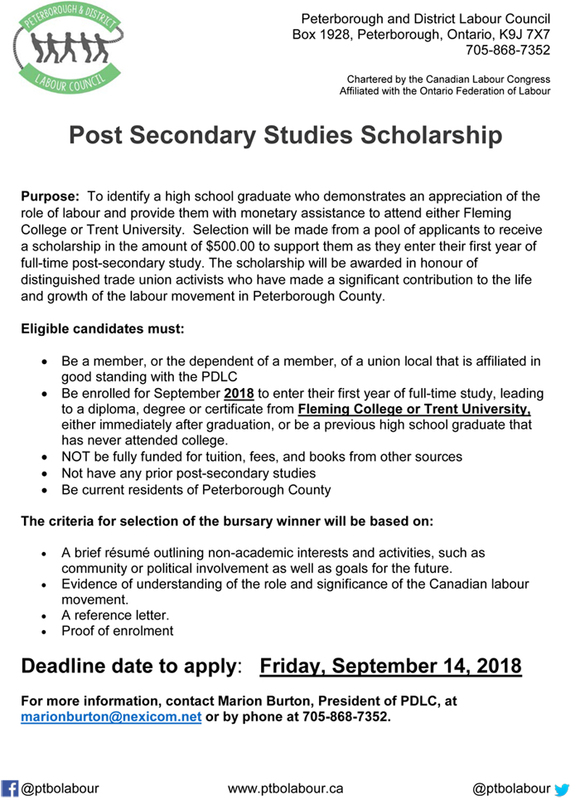 The scholarship will be awarded in honour of distinguished trade union activists who have made a significant contribution to the life and growth of the labour movement in Peterborough County.